Deciduous, this tropical American species, at maturity forms a large tree with a spreading canopy and dark fibrous bark. The dark green glossy leaves are bipinnate. Flowers are borne at the end of a peduncle about 8 cm long, form fluffy clusters, numerous stamens, which white in the lower half, then pink, are about 2.5 cm long. Pods are thick, oblong to about 20 x 2 cm. 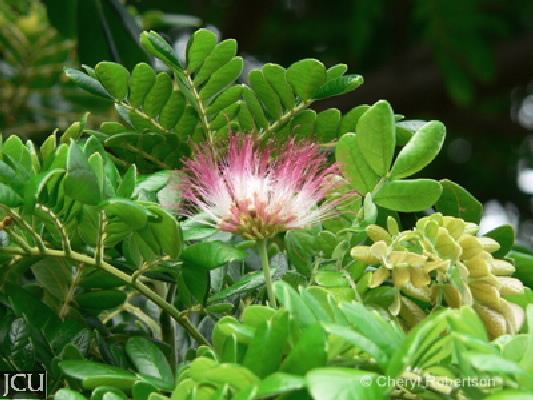 This tree is sometimes confused with Albizia lebbeck which has cream flowers and papery pods.